I only 'discovered' muesli last year, when we visited Australia's Daintree region. Our accommodation included breakfast, and my vegan-friendly option was muesli with a generous quota of dried tropical fruits. Contrary to all my muesli beliefs, I liked it! In addition to the tropical fruits, I appreciated the oats being only lightly toasted - just enough to give a slight crisp without hiding the underlying texture and flavour of the oats. I realised that my muesli stereotypes were based on supermarket mueslis, and there were other, better, options out there. Despite that discovery, I haven't had muesli since. I haven't really felt the need. I love raw oats with yoghurt and cooked oats as porridge, and also tend to have at least two commercial cereals in the cupboard at any given time. The few commercial mueslis that might appeal to me are, generally speaking, quite pricey. The idea of homemade muesli appealed, but the logistics of making it never seemed to happen. Fortunately, Vegan MoFo has provided me with the motivation to make it happen. To add a little sparkle to my muesli batch, I incorporated oven-baked strawberry and apple pieces, as well as a scattering of seeds and raisins. For good measure, I threw in some toasted buckwheat too and lightly toasted one cup of oats whilst leaving another cup raw The result was a naturally sweetened, very lightly toasted muesli that passed my exacting standards. I tried the muesli with almond milk and with yogurt, and yogurt was definitely my favourite of the two options. Vanilla soy yogurt was nice, but natural coconut yogurt (I used the CoYo brand) was even better. A breakfast parfait with this muesli, coconut yogurt and blueberries made for a surprisingly luxurious start to the day! I am still not likely to make muesli every month, but I can definitely see myself making it again before too long. To dehydrate the apple and strawberry pieces: Preheat your oven to 100'C and line two baking trays with non-stick paper. Place your chopped apple pieces and sliced strawberries evenly across the trays and dehydrate in the oven for 2 to 2-1/2 hours, until dry and crispy. Remove from the baking trays and allow to cool at room temperature. To lightly toast oats and nuts/seeds (optional): Increase your oven temperature to 200'C and arrange 1 cup of oats and your nuts / seeds across your baking trays, using a new set of non-stick paper if necessary. Roast for 10 to 15 minutes, monitoring closely to ensure the nuts don't burn. The nuts should smell fragrant when ready, and the oats will be starting to turn golden in colour. Again, allow to cool at room temperature after roasting. If using untoasted buckwheat (skip if using toasted buckwheat, i.e., kasha): Place the buckwheat in the bottom of a large saucepan or other heavy bottomed pan, and roast over high heat for approximately 4 minutes. Toss the buckwheat regularly to avoid sticking and burning. It will darken in colour when roasted. Again, allow to cool at room temperature after roasting. To make the muesli: When all ingredients are ready, combine the dried apple and strawberry pieces, roasted oats, nuts / seeds, roasted buckwheat groats, raw oats, dried fruit and spices. I found it helpful to combine in a container with a lid, so you can shake the ingredients to mix thoroughly. This post is part of my participation in the 2014 Vegan Month of Food. 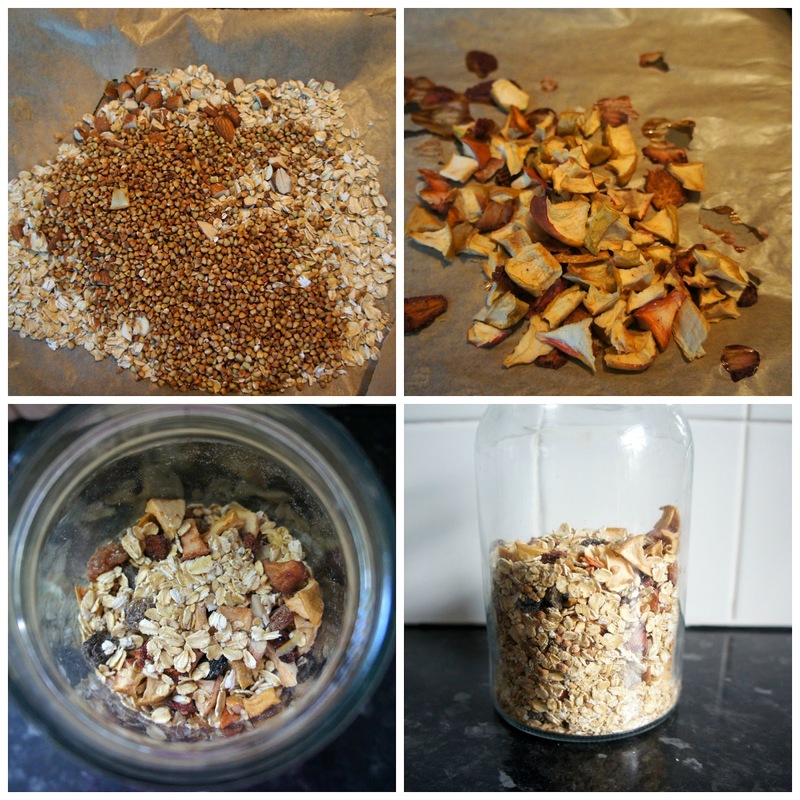 Do you make your own muesli? What is your favourite mix? The muesli looks really delicious (much better than any supermarket option could ever be). I was rather enamored with the swirl! Wow that is amazing that you baked your apple and strawberry to go in this - I lightly roasted some strawberries for a recipe in vegan mofo but hadn't thought of actually dehydrating them. I love home made muesli (shop bought is often too sugary) but rarely make it. Your yoghurt, muesli and blueberries make me really want some. Ooh, that chocolate muesli sounds great! I was actually surprised at how easy dehydrating strawberries turned out to be - sometimes ovens just don't dehydrate well enough, but the strawberry pieces (and apple for that matter) turned out fine, perhaps because they were so small. I love it served in a glass as a parfait - I've never thought to do that. It's a really fun way to make breakfast seem more special! I bought the Pura Veda brand of muesli on the weekend and when I got home and looked through all the ingredients, I realised I just about have them all in the pantry. I think I'll be making my own from now on! Wow Kari, I'm impresssed that you even dried your own fruit for this recipe! I don't often eat muesli but I do quite like it Bircher style, soaked in milk or yogurt overnight and then with extra fresh fruit chopped in in the morning. The Rude Health kind is nice as there's no added sugar unlike most. I am a muesli lover and eat almost any combination! As long as there's nuts, fruits and oats, I'm happy! This looks like my kind of brekky! Looks really tasty. We make all our own cereal, or cereal equivalents, so will def add this to the list :-) My daughter loves something other than plain oats for breakfast so that is why we are constantly making our own - hubby and I are also easy to please with plain oats, or buckwheat. Plain oats are often my favourite too, but variety is nice sometimes. I am impressed you make everything from scratch!